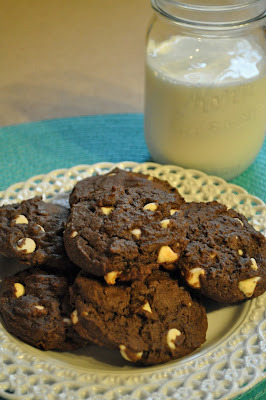 The kids have been asking me for cookies...okay, confession, I have been wanting some cookies. :) But they never object and I never have to talk them into a batch of cookies. 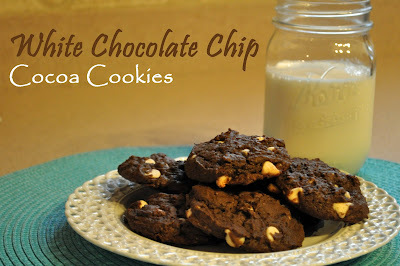 So on Saturday, I decided to whip up a batch using ingredients I already had in the pantry. Typically, I make chocolate chip or monster cookies (view recipe here) but I didn't have the ingredients for either one of those. I did have white chocolate chips. My mom always made a cookie that was chocolate with white chocolate chips. As a kid, I aways referred to them as opposite cookies. I didn't have the recipe on hand and she was out of town, so I improvised. I must say they came out really good and I decided the recipe was worthy of being shared. I am sure I am breaking all the rules when I say this but....dump everything into a stand mixer. That's right, you heard me. ) After I cream the butter and sugar, I dump everything (except the white chocolate chips) in at once and then start the mixer on low. I know you should really mix all of your dry ingredients and then all of wet ingredients and then slowly incorporate everything together. BUT, I was having a major cookie craving - there wasn't any time to follow rules! Scoop dough onto baking sheets. Bake in 375 degree oven for 9-11 minutes. Now, go grab a glass of ice cold milk, a cookie or two, or three, or.... and cozy up on the couch!